As the nation’s first Catholic-Franciscan university, we believe in the goodness of every person and the ability of every person to do extraordinary things. In fact, St. Bonaventure University graduates are leading some of the world’s largest and most well-known businesses and schools; they’re working for every major broadcast network. St. Bonaventure alumni include Six Pulitzer Prize winners. 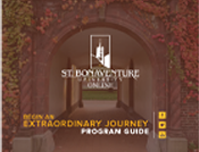 Apply for admissions at St. Bonaventure University Online at any time. Complete the form on this page or call 1-844-424-4960 to speak with an Online Enrollment Advisor.